A garden should be more about what you have and what you've done than about what you don't have or haven't done. Gardeners, me included, spend too much time thinking about all that needs to be done and all the plants we want to get, which can be discouraging. Sometimes you just have to sit back and think of all that you have done and all that you do have in your garden. The end of May is a good time to do that. What I have right now is a lot of yellow flowers. Want to see them? 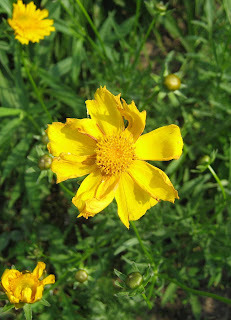 This first flower is a coreopsis, Coreopsis lanceolata. I grew it from seed back in 2000. Let's all take a vow to not call this by its common, Tickseed. That's a terrible name for a carefree flower like this! 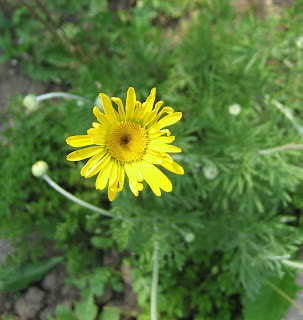 This is a yellow daisy flower with silver, lacy foliage. I long ago lost the name of this flower, so if someone has an ID on it, please let me know. It self sows quite a bit, but not in an annoying way, more in a way that you end up with lots of little starts to passalong to others. If I want to impress someone who comes to visit, I won't call it "yellow daisy that I forget the name of", I'll call it Daisius argentifolia 'May Dreams'. The evening primrose is blooming! This one is Oenotherea tetragona 'Sunspot'. It isn't real obvious from the picture but the foliage has little yellow spots on it. This forms a nice clump, so it would be easy enough to cut out a few starts to passalong to others. To put a positive spin on this next yellow flower, I won't say, "this is a weed that I just haven't pulled yet". Instead it is a wildflower that I have let stay for awhile. I wish I knew the name of it. Anyone? I once took a course in Weed Science, but don't recall having to learn about this particular weed. Maybe it's a more recent import and wasn't so prevalent 'back in the day' when I was in college? You don't think I once knew what it was and forgot, do you? I bought some yellow Lantana to put in hanging baskets. I like how they are performing now. They are in full sun and seem to be able to take it in stride. 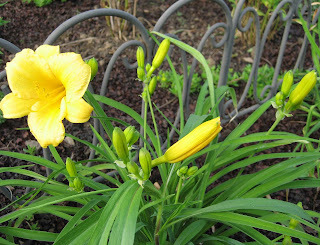 I can't really have a post about yellow flowers without showing the Stella d'Oro daylilies. At least, that's what I think this is. I'm not 100 percent positive, but I don't recall buying any other yellow daylilies, so that must be what it is. This is another plant that is easy to dig and divide and passalong to others. And look at all those buds, I'll have flowers on these all summer long. I'll wrap up with some yellow foliage. 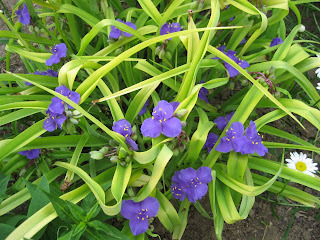 This is Tradescantia 'Sweet Kate'. In previous posts and on the last Garden Bloggers' Bloom Day, I mis-identified this as 'Blue and Gold'. I think they are probably quite similar. There you have it, those are my yellow flowers blooming now. Since I've focusing on what I have, I won't mention that I don't yet have yellow tomato or squash flowers yet. I'll have some soon enough, I'm sure. So Happy Gardening and please enjoy the last day of May tomorrow by remembering what you have in your garden and what you've done so far this spring. I'm sure it's a lot. That's quite an observation dear Carol. Not only in our Garden, but I guess, in other aspects of our lives too, we are troubled more by the have nots while ignoring what we have. Sometimes we just need to sit back, look at and enjoy what is already there and if there are some yellow flowers blooming,it can only add to the pleasure as yellow color has the ability to brighten up the day and the mood. I am glad you have taken it upon yourself to give us gardeners pep talks. Every day I start out grumpy thinking about all the things I have to do that are not gardening, but I stop by here and get my dose of Carol's sunshine, and it helps. The cross shaped flowers of your wild plant tell me it is in the Crucifer family. I have a real handy book called Weeds of the Northeast, and based on comparing its photo with yours, I'd say that's a fine specimen of Rorippa islandica. No, I am not making that up. 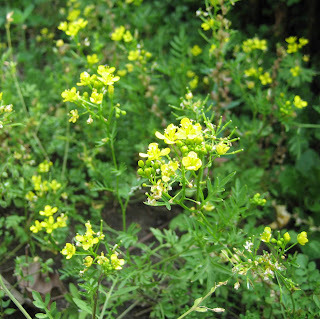 Aka marsh yellowcress. Google it and see if you think I guessed right. That's a lot of yellow, and you are right that we should concentrate on what we do have instead of what we don't. But if I look at the color I have most in the garden right now, it would be light brown. That's right, I have more bare dry soil that anything else. most of my vegetable plants are still small and haven't filled in the beds yet. If I write a post about "brown", I don't think it would be as interesting or as beautiful as your "yellow" post! 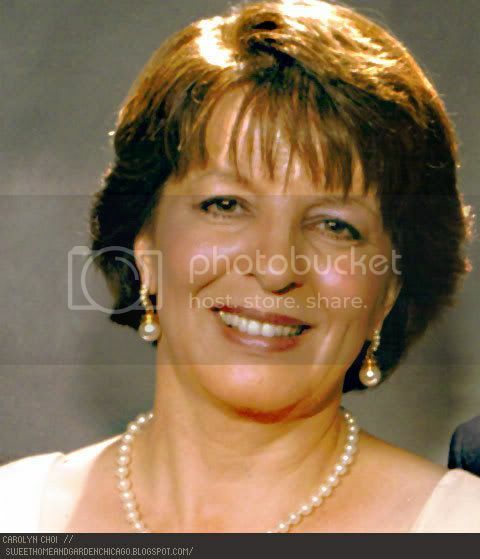 Hi Carol, Thanks for your comments on my blog! Thanks for the encouraging post. I am always thinking on my "to do" list, and forget how far we've come with what was once just bare rocky ground. My dear husband has been such a good sport in helping all my garden visions come true! I too think your weed is a cress, although we don't have this one here. 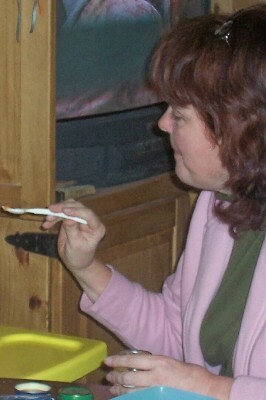 It's obviously, as Kathy noted, a cruciferous plant, and it's not wild radish. It's quite charming, unless like the cress we have it spreads wickedly. I was thinking the weed might be jewelweed, from the shape of the flowers, but I'm not sure. I've seen it in orange and in yellow. My garden has a lot of pink in it, surprisingly, since it isn't my favorite color; but I guess that it is, in the garden. Although I have a busy schedule I always pencil in a few minutes of gloating over my garden accomplishments every day. 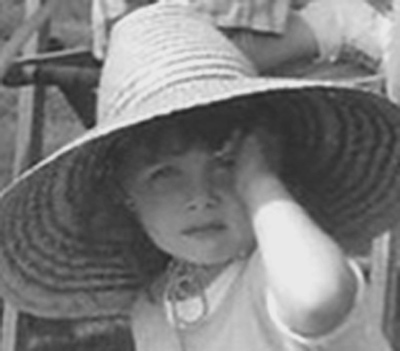 ;-) And now that I blog, it's easier to look back and see what I have done. Love all those yellow flowers, yellow is a wonderful colour! The evening primrose is very pretty and I can't understand why I don't have daylilies. Almost every garden blogger I visit has them. Yours look great too! I think the only yellow I've got right now is columbine. I'm getting a lot of red right now. 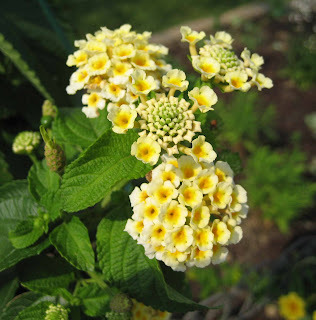 I'm not a big fan of Lantana, but that yellow and white variety you've got is very pretty. Carol: I love all the yellow you have. 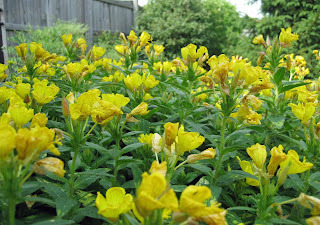 I'm discovering that I really enjoy yellow in the garden - it's bright and cheery, and plays well with most other colors. Alyssa... I've seen a lot of posts from gardeners with mostly purple and lilac colored flowers now. I need to get some with those colors to mix it up a bit in my garden. Green Thumb... Thanks for the affirming comment, and I agree that yellow flowers are so bright they have to make you happy! Kathy...I know you are a busy person these days! I think you are correct that this is a Rorippa, but I think it might be R. austriaca now that I look it up. The leaves are a closer match. My book is Weeds of the North Central States. We are geeky gardeners to be sure to have books on weeds! Marc...I've got a lot of brown in my vegetable garden, too, which will hopefully be a lot of green in a few weeks. Connie... Thanks for naming my daisy. That sounds quite familiar! SmilnSigh...I'd like to have more pink and rose colored flowers to balance things out. I don't know how I ended up with so many yellow flowers. Jodi...Unfortunately the cress I pictured spreads wildly. I have trouble keeping up with it, as you can see. I can't believe you still have daffodils blooming! Lucette...Thanks for the comment. All the yellow I have is purely by accident! Yolanda Elizabet...Maybe daylilies just haven't caught on in the Netherlands. Here they are so common, I think some gardeners avoid them because of that, and they are missing out! R Sorrell...I don't have much red in my garden and like you, I wasn't a big fan of Lantana, but for some reason I was drawn to it this spring and bought quite a few plants to put in hanging baskets. Tracy...Your post for the book club came in plenty of time. I also think yellow plays well with other flower colors. What doesn't it go with? Early Bird...I didn't think I was a big fan of yellow flowers, either, but I sure do have a lot of them. Thanks all for the wonderful comments! I'll trade you some blue for your yellow, Carol ! I just wrote a post last week on how much blue I've got ! Yellow is so cheerful ! I love yellow, it's such a sunny cheerful and friendly color. The plant you don't know the name of is a type of rocket (Arugula). I have a big patch of it in my vegetable garden, and it tastes yummy on sandwiches, salads, and cooked like a green.